Main currents in American thought about money and Wall Street, traced by journalist Fraser (Labor Will Rule, 1991, etc.) in an expansive social history. The same attraction and greed that brought colonial traders together in the Street’s coffeehouses or under its fabled buttonwood tree (fictional, debunks Fraser) continue to gather hustlers in myriad Starbucks or under trees everywhere in the world. 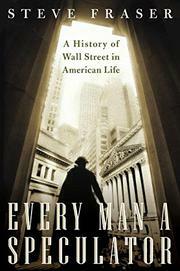 The Wall Street of the American mind contains capital markets, commodities exchanges, mighty banking institutions, bucket shops, lenders, borrowers, buyers, sellers, owners, workers, debtors, creditors, confidence men, dupes, builders, thieves, entrepreneurs, swindlers, billionaires, tricksters, bulls, bears, and pigs. Fraser’s grand, often incisive, survey begins with the Founders (Hamilton in particular) and the first IPO (the Bank of the US in 1791). We meet moguls and miscreants, including Gilded Age titans like Cornelius Vanderbilt, August Belmont, and evil Jay Gould. The author depicts Populists, muckrakers, Liberty Bonds, the Jazz Age, the Crash, Andrew Mellon, and Jay Gatsby. He neglects nothing of social significance, from Ponzi and the New Deal to Milken, the Long Term Capital Management fiasco, and WorldCom. He analyzes books, music and art as meaningful signals, paying heed to Melville, Dreiser, Dos Passos, Auchincloss, and Tom Wolfe, among others. He considers such cultural phenomena as agitprop, Thomas Nast, Eddie Cantor, Gordon Gekko, the Depression’s Big Bad Wolf, and J.P. Morgan’s nose. He bemoans the repeal of Glass-Steagall, the statute that once kept banks from being brokers. And he discerns a recurrent theme rarely noted by other surveyors of the Street: anti-Semitism, which prompted implausible accusations of Jewish manipulations from the likes of Father Coughlin and Henry Ford. Certainly, “Wall Street” is a synecdoche for much of our commercial culture. Will attentive readers be quite ready to privatize some of their Social Security funds after this visit to the lair of the plutocrats? Comprehensive, considered, and literate: a real accomplishment.